Triglyceride Assay Kit (ab65336) is a sensitive, easy assay to measure triglyceride concentration in mammalian samples. In the triglyceride assay protocol, triglycerides are converted to free fatty acids and glycerol. Glycerol is then oxidized to generate a product which reacts with a probe to generate color (spectrophotometry at λ= 570 nm) and fluorescence (Ex/Em = 535/587 nm). If your sample contains reducing substances such as glucose, fructose or lactose, they are likely to interfere with the assay. In this case, we recommend using Triglyceride Assay Kit (Fluorometric, Reducing samples) ab178780. Some components of this kit are available to purchase as standalone reagents if you need more quantities (lipase, enzyme mix, triglyceride standard or triglyceride probe). Please contact our team for more details. Triglycerides are the main constituent of vegetable oil, animal fat, LDL and VLDL, and play an important role as transporters of fatty acids as well as serving as an energy source. Triglycerides are broken down into fatty acids and glycerol, after which both can serve as substrates for energy producing and metabolic pathways. High blood levels of triglycerides are implicated in atherosclerosis, heart disease and stroke as well as in pancreatitis. Functional studies - ab65336Image from Samuel P et al., PLoS One 8(1), Fig 7b. doi: 10.1371/journal.pone.0048425. Hepatic triglyceride levels was measured using ab65336 in male and female wild-type (WT) or AT2KO (knockout) mice with either normal diet (ND) or high fat diet (HFD). Triglyceride measured in cell culture lysates showing quantity (nmol) per 1 mln cells. Samples with the concentration of 1e7 cells/mL were used. Samples were diluted 40-80 fold and measured fluorometrically. HepG2 cells were treated with 25 uM Chloroquine for 72h. 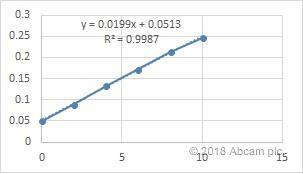 Colorimetric triglyceride standard curve using ab65336. Can we use either Tween-20 or Triton-X instead of NP-40 with this kit? We prefer NP40 to Triton or tween in this assay. NP-40 works better to keep lipids in solution and does not create background in the assay. What is the difference between ab178780 and ab65336? The picoprobe allows ab178780 to be more sensitive than the ab65336. ab178780 detects triglycerides <0.4uM whereas ab65336 can detect 2uM-10mM triglycerides. What is the source of the triglyceride standard? What is the source of the lipase? The lipase is from a bacterial source and the standards are from plant oils. Can plasma samples be applied directly? Protocol booklet shows only serum sample. Yes, I can confirm that there should be no problem to treat the plasma samples in the same way as the serum, directly applying it. 1) I found a white upper top layer after centrifugation to remove insoluble material from liver samples. Should I remove it or not? 2) SV is the sample volume (before dilution) added in sample wells (µl). My samples were diluted 10 fold with water before the assay. To get values are within range, these samples were diluted (60 fold) with Triglyceride assay buffer. Is the SV mean calculated before 60 fold dilution or after? When I calculate the final value, do I need to include the initial 10 fold dilution? 1) The insoluble top layer may contain the triglyceride you wish to measure so please make sure to solubilize as much as possible (without losing any material) and to follow the recommendations (ie. repeated heating steps). 2) SV is indeed the abbreviation for sample volume. For calculating the final results, you need to take into account all the dilution steps you have made during the procedure so dilutions factors (10 and 60 fold need to be included in the calculation). Would like to know whether a plate is provided together with this kit or can we use any normal 96 well plate? The 96 well plate is not provided with the kit. Please use a black plate (clear bottom) for fluorescence and clear plate for colorimetric analysis. Does the Triglyceride Standard provided in this kit have a known molar mass? The standard provided with ab65336 has a molecular weight if 885.43 g/mol. The values obtained from Triglyceride quantification kit (ab65336 are presented as a µmol/ml. How can I convert µmol/ml to mg/g tissue? 1 mol/L is represented as 1mM, E.g. 50 mM is 50 mmol/L. Divide by the molecular weight of the substance (average triglyceride molecular weight in your sample) to convert from moles to grams. Then mM/mol weight can be converted to get mg/L. 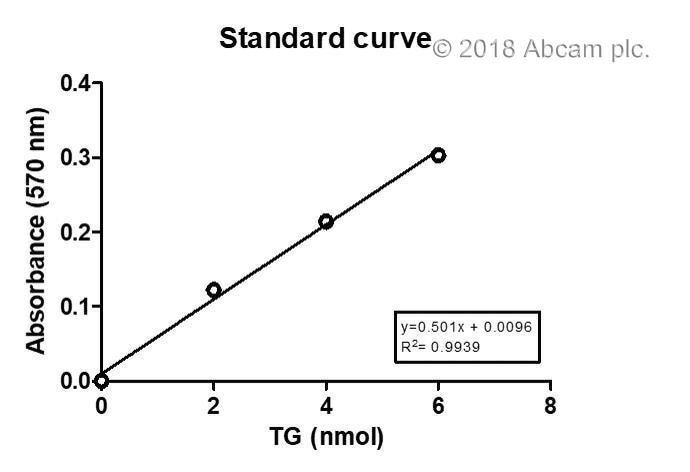 For this assay, since it is difficult to say the molar mass of triglyceride, unless which specific one is present in the sample is known, the accepted most common way of reporting the data is as mM or µmol/ml. Mouse blood was obtained by cardiac puncture in heparinized tubes and centrifuged at 13000 rpm for 2 min at 4 degrees. Plasma was subsequently diluted 1:20 in PBS for testing. This kit is easy to use and fast, and gives blood triglyceride concentrations in line with what is reported by literature. Our experience gives reproducible results across the different kit lots. The protocol is easy to understand and perform. We determined the TG level in liver tissue to use in subsequent assays.